A few weeks ago, I met Cynthia Presser and was invited to her home to experience the cuisine that will be featured at Taste of Brazil. She and I became Facebook friends a few months ago due to our mutual love of food. She has a food blog too at www.cynthiapresser.com. When I showed the site to Jon, he said she was out of our league! And after trying her food, I agree. From the moment I met her, two things were clear: she is passionate about food and proud of her Brazilian heritage. Born and raised in the southern region of Brazil, she began experimenting with food at a young age. She said she made a lot of mistakes a long the way, but has worked hard to refine her signature recipes. Her husband enjoys her food so much, he encouraged her to share it with others and that’s when she launched her website. So many people loved her site and wanted to know more, so last year, she took it a step further by organizing Taste of Brazil, an event hosted at The Philmore on Broadway, featuring Brazilian food and entertainment. The event was so successful last year, Cynthia is going to do it again with the help of her husband, the staff at The Philmore, and the chefs from Catablu, on July 14. The cost to attend is $37.50 per person, which includes a complimentary drink at the door. 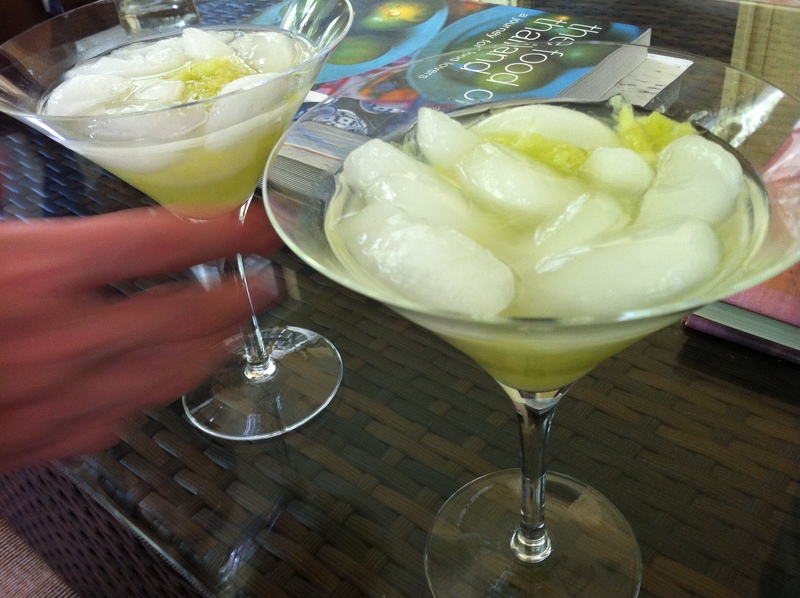 The complimentary drink is called Caipirinha, the most popular Brazilian drink. It is made from lime, sugar and Brazilian rum. She made one for Jon and I when we visited and we loved it- tangy, sweet, and smooth… we could get in a lot of trouble if we can get our hands on that Brazilian rum, which Cynthia says is impossible to find here so she brings it back with her when she visits Brazil. Various dishes will be available at the event and you can view the full menu on Cynthia’s site. For us, she prepared Shrimp Moqueca and Picanha & Chimichurri sauce. Both dishes were oustanding- so flavorful, so rich in taste and texture. 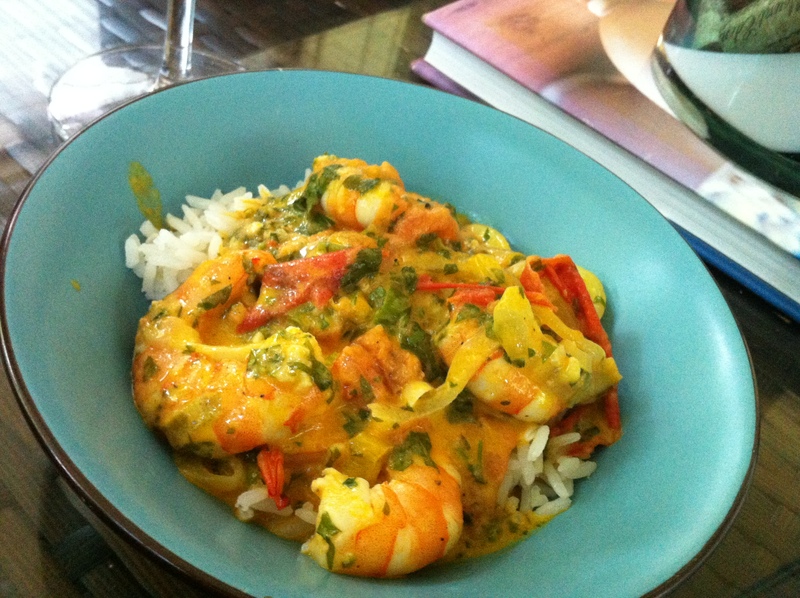 I loved the taste of the coconut milk in the shrimp dish combined with the subtle flavor of the red palm oil, which Cynthia admits not many people cook with, but it’s a staple in Brazilian cooking. The steak was out of this world. 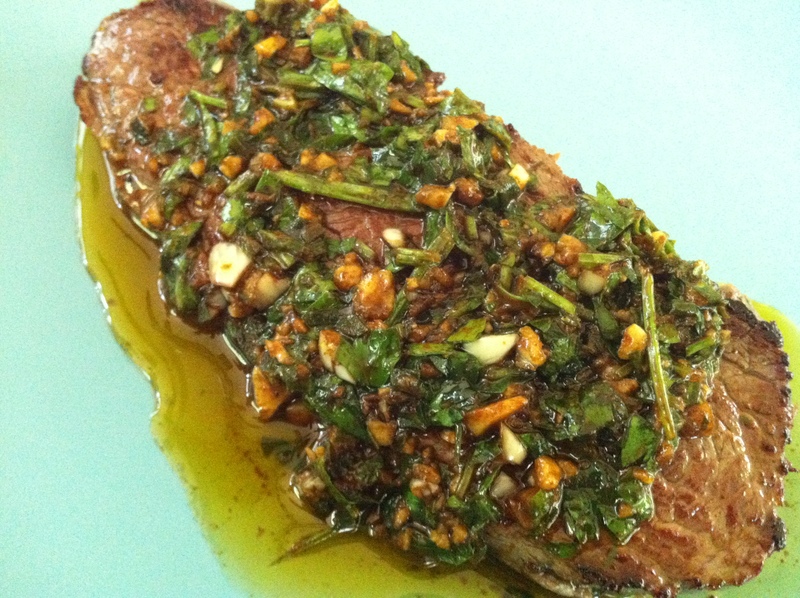 She sauteed it to just cooler than medium rare (“bloody” like I like it) and smothered it in the mouthwatering Chimichurri sauce. She laughed when she told us they stole the recipe from the Argentinians. At the end of the evening, Jon and I were feeling euphoric- that feeling only a well rounded, quality meal can give you. I highly recommend you attend Taste of Brazil at The Philmore. Not only will the food be fantastic, but the entertainment will be out of sight, too. Cynthia has invited a band from Chicago to perform traditional Brazilian song and dance. It will be a colorful, energetic night, transporting guests to Rio. Thanks for the comment. It is an annual event, so be sure to check it out next year. Can’t wait to check out your blog. We love Brazilian food too.